Orange and "3" merged in 2013 into one network and the Orange brandname was dropped, but still two different "3" networks are shown when you make a scan. In addition there are many resellers or MVNOs on all networks. 2G GSM is on 900 and 1800 MHz like in most of Europe. 3G UMTS is on 2100 MHz. 4G/LTE is on 2600 MHz (B7) in cities and 800 MHz (B20) on the countryside on A1, on 800 MHz (B7), 1800 MHz (B3) and 2600 MHz (B7) on T-Mobile and on 900 MHz (B8), 1800 MHz (B3), 2100 MHz (B1) and 2600 (B7) MHz on 3. Mobile coverage is excellent for a country with a difficult topography and similar to Switzerland on a very high level. In 4G/LTE both A1 and 3 cover >98%, T-Mobile is slightly behind at 90% of the population. This survey follows the historical order mostly used in the country and is no ranking. Data rates in Austria are among the lowest in Central Europe. Ironically, there are hardly any good EU roaming offers for prepaid cards. While data packages are sold domestically for as low as 0.1c per MB, EU roaming rates are still mostly around 6c per MB. A prepaid SIM card is locally called "Wertkarte". This is a specific Austrian expression, not used in Germany. Unlike some other European countries, SIM cards in Austria have been anonymous and were not registered until the end of 2018. A new security law required all new prepaid SIM cards to be registered from 1/JAN/2019. All previously existing prepaid SIM cards need to be registered by 1/SEP/2019 or they will no longer be able to be recharged thereafter. Though all top-ups made until this date will remain valid beyond. The exact implementation of the registration scheme is still evolving. In the country the branded shops of the major providers will do the registration for free. Often partner shops do the same, but may charge up to 10 €. Most brands can be registered through an online verification process like in Germany. Be aware that not all brands accept foreign IDs for their online registration. You can also use any shop displaying the green sign "Hier Wertkarte registrieren". Most post offices will do the registration too. You will need to show your ID card or passport. MediaMarkt and Saturn have suspended their own brands because of the new registration scheme. It's not known, what's happening with the brands sold in supermarkets, service stations or at tobacconists. The be prepared to go to a different place or online for registration. Online top-up vouchers are available for most networks at onlineaufladen.at without surcharges. Note that if you would like to use your credit or debit card on this website, payments are possible with Mastercard Securecode , Verified by Visa , Diners Club and Maestro Cards that have Mastercard Securecode enabled. Visitors from some EU countries may also use their online banking account to buy top-ups. Since this is restricted to certain countries and banks, check beforehand if your country is in the drop down menu. Further, you need to be able to receive text messages to you home SIM, so if you dont want to connect it to a network in Austria, this method wont work. Minimum top-up value is mostly 10 €. For top-ups most Austrian retailers don't sell scratch cards, but hand out a paper slip with a PIN code. This usually involves either picking up a tag like seen here or asking the cashier for a Ladebon (= recharge voucher) for your carrier. You will be issued a paper slip containing the voucher PIN to be entered into your phone. Austria is part of the EU, where since 2017 new international roaming rules have been enforced. In most European countries you can now 'roam like at home' on a Austrian SIM card at domestic rates rather than excessive roaming rates. For specifics about the new regulation check European Union chapter and every provider below. The Austrian operators follow different approaches. Some block data roaming completely or apply a limit of about 2.8 GB per 10 € retail price of the plan, that is given out at domestic rates. All providers apply a surcharge of 0.72c per MB for continuous roaming after more than 4 months. This means that the price for EU roaming is mostly between 3.60 € per GB (as long as you stay within the included EU roaming allowance) and 7.20 € per GB (when the excess rate is applied). So roaming data use on Austrian SIM cards abroad remains much more expensive than domestic use in Austria, even under the 'Roam like at Home' rules. A1 by Telekom Austria that is still the biggest telecommunication provider in the country with a very high standard: A1 coverage map 4G/LTE has been started on 800 MHz in the countryside and 2600 MHz in the cities covering 98% of population in 2019. It's now available for prepaid too. The starter pack is called B.free Welcome package. It's sold in their stores and many agencies like post offices, Metro, Saturn, Media Markt, Niedermeyer, Libro, Lidl, MPREIS, Hartlauer etc. Standard, micro and nano SIM are sold. Top-up vouchers of 10, 20 or 40 € can be found everywhere in the country at A1 shops, post offices, supermarkets, tobacco shops and service stations. To top-up, type *102*<voucher code>#. To check balance, type *101#. All new SIM cards must be registered now and existing SIM cards until 31/AUG/2019. This can be done in A1-Shops, partner stores, post offices and online for free. All packages auto-renew after after 28 days or can be renewed ahead of time by re-entering the activation code. Overuse and usage of Austria packages in EU roaming are high at 0.40 € per MB. Note that voice and SMS is enabled too, but at a high rate of 0.40 € per minute or SMS. Data is valid in Austria only, roaming outside Austria is not blocked, but at a high 0.40 € per MB, except on the EU plan and on the Net Cube plan, where it's disabled. EU roaming is severly restricted with A1 on their Austrian and internet plans, while it's given out according to the rules in their EU plans only. After 4 months of continuous roaming a surcharge of 0.72c per MB is applied. Their default roaming rate is at a very high 0.40 € per MB. Note there is no 4G/LTE roaming so far for prepaid. T-Mobile Austria is considered to have the best 4G network , and a good coverage within the country on GSM and UMTS, slightly behind A1 and Drei, but still on a generally high level. 4G/LTE has been rolled out and is available on prepaid without surcharges. It covers 97% of the population in 2019: T-Mobile coverage map. Their prepaid lines are called "Klax" and are sold online and in a lot of shops: T-Mobile shop finder . Standard and micro SIM, although depending on the retailer nano SIM packs also available. Top-up vouchers are widely available. Top-ups are by vouchers of 10, 15, 20 or 40 € sold in many shops. Check credit by dialing code *101# and data credit by *114#. New SIM cards need to be registered, existing ones by 31/AUG/2019. This can be done in T-Mobile shops for free and in partner shops for up to 10 €. You can also use their online registration system by video chat, if you have a passport from one of these countries: AT, BA, CH, CZ, DE, HR, HU, IT, LIE, LUX, PL, RO, RS, SI, SK, TR. All new and existing customers receive a 50 GB bonus (as up to 10 GB per month for up to 5 months), if they register their SIM cards by 31/MAR/2019 and top-up at least € 10. In 2017 T-Mobile changed their portfolio and introduced the 'Die-Wie-ich-will-SIM' (= The "How I want" SIM), now officially called My Klax Flex. The starter pack is offered for € 10: "My Klax Flex " containing 5,000 units (as mins, SMS or MB) for 28 days. Activation: text 'FLEX' to 2222. Activation is by texting code to 0676 2222. You can add a speed boost for € 3 per month to get 100 Mbit/s. All packages auto-renew for the same price after 28 days. In case of unsufficient credit for the auto-renewal the chosen plan stays active for 4 months. After 4 months you are switched to the default rate. The add-on packages are valid until the end of the running time of the base Surfklax bundle. There are also add-ons for more speed: 50/10 Mbit/s at 4.99 €, 150/50 Mbit/s at 9.99 € and 300/50 Mbit/s at 14.99 €. The first number is max. download, the second max. upload and they are all valid for 1 month. Note, that there is absolutely no international data roaming on Surfklax possible and voice and SMS roaming requires registration. Note that international roaming is blocked on My Klax Flex and Surfklax SIM cards by default. You can only use voice and SMS for roaming outside Austria at domestic rates, if you register your SIM card online, but data roaming remains disabled with no way to activate it. Drei.at Austria (called 'drei' spoken like 'dry' for 3) used to be the smallest network in the country until they bought Orange and merged in 2013 to be become a very competitive player. 4G/LTE is on 1800 and 2600 MHz and covers already 98% of population: 3 coverage map. Their market share is now on par with T-Mobile and network coverage and speeds are on par with A1 in 2017 on a high level. In the meantime, Drei has opened 4G/LTE for most of their prepaid plans. They offer the lowest rates of any network operator. 3 offers domestic roaming with the "3-AT" (T-Mobile 2G) network. Through automatic selection your phone will switch to this network if the connection to the home 3 network becomes weak. Even though you don't pay a surcharge for using "3-AT", roaming data is limited. So either stick to 3 network by manual selection or enable roaming data. All new SIM cards need to be registered and all existing too by 31/AUG/2019. This can be done in Drei Shops and at certain resellers for free. Their online registration options exclude foreigners without an Austrian bank account or ID so far. A further online system is announced, but not yet implemented. Both are sold at 9.90 €. Talk comes with 1000 domestic minutes, 1000 domestic SMS and 4 GB data while Surf comes with 10 GB data. Both are valid for 30 days and can't be switched. Their SIM cards can be found in kiosks, phone stores, at Libro (store locator) or Hartlauer. Interestingly, Drei shops (shop list) don't sell prepaid cards, only contracts. Standard SIM, micro SIM and nano SIMs are available. Top-up cards can be found at many stores, kiosks, petrol stations and supermarkets. Online reloads by many international credit cards are accepted. as Klassik (roaming blocked) or EU Klassik (roaming possible) plan without any allowances and data at 0.15 € per MB @ max. 10 Mbit/s. The max. speed of the add-ons depend on the max. speed of the base plan. Package won't be renewed automatically after 30 days. This is done, when you go online for the first time thereafter and have enough credit on your account. The same happens when your data volume is used up ahead of time and you have enough credit for another bundle. Otherwise rate will be charged at high 0.35 € per MB. To check remaining allowance, download the 3 Kundenzone (= 3 customer zone) app from the App or Google Play Store. When you open the app, press Automatisch erkennen (= detect automatically) and you will be redirected automatically (please note that this WILL NOT work on WIFI, but only when checking on mobile data). Activity done in 3 Kundenzone will NOT be withdrawn from your data allowance. Some of the plans are completely blocked for roaming but allow more data to be used in Austria. Plans which are not blocked for roaming have less data for same money, but data can be fully used in EU roaming. You can easily switch between plans, however this may require a trip to a 3Shop if your online account does not have the option to change tariffs online. Drei treats the Channel Islands as "EU-zone" for voice and SMS only. Data is charged at excessive 15 € per MB. Note that for the Nimm3 Surf tariffs, only the Flat tariffs have EU roaming, up to the given limit. Telering is a sub-brand of T-Mobile using the T-Mobile network (details see above) in 2G and 3G and 4G/LTE. They have blocked all international data roaming abroad. So for mobile internet you can use it only in Austria. Their current prepaid data SIM is called "schlaue SIM" (clever SIM) and sold online to be sent to an Austrian address or at shops. For registration check T-Mobile section. Top-up vouchers can be bought online, at post offices, in Libro, Penny stores and many kiosks. This packs renew every 28 days for the same fee. Note, that there is an inactivity fee of 0.50 € per month charged after 4 months of inactivity. To top-up use vouchers of 10, 15, 20 or 35 € sold in tobacco shops and post offices and other stores. Enter *104*<voucher code>#. Check balance by *101#. Be aware that international roaming is blocked on all plans by default. You can use tele.ring outside Austria only for voice and SMS if you register your SIM card online. Then the included min/SMS units can be used within EU ("Roam Like At Home") otherwise a surcharge will be added. Data roaming stays always blocked. Yesss! is a brand of A1 and operates on the A1 network on 2G, 3G and since 2016 on 4G/LTE for all prepaid plans. It uses their good IP backbone but behaves different when roaming. Yesss! SIMs can be purchased online to be sent to an Austrian postal address. Yesss! starter packs are available in all supermarkets of the Rewe chain called Billa, Merkur, Libro stores, in post offices and in some petrol stations, too. For registration check A1 section. Yesss! Startersets are sold for € 1.99 as a triple SIM cut out for mini, micro and nano. They contain 100 units as domestic SMS, voice minutes or MB data, and 15 mins to customer support. All included allowances are valid for 30 days. Sometimes this offer differs in promotions. Minimal online top-up amount is €10; larger amounts are in €1 increments up to €100. This applies to both www.yesss.at and onlineaufladen.at. Top-up vouchers are available with €10 and €20 amounts. To check credit balance, type *121#. Complete L: € 9.99 with 1500 units (as mins or SMS), 8 GB data (of which 3.7 GB in EU roaming): speed 100 Mbps, activation text 'paket complete L' to 810820. 1 GB (in EU roaming too): € 4, max. 50 Mbps, activation: 'paket 1gb' to 810820, this package doesn't auto-renew! 5 GB (in EU roaming max. 2.3 GB): € 5.99, max. 100 Mbps, activation: 'paket 3gb' to 810820. 9 GB (in EU roaming max. 3.7 GB): € 9.99, max. 150 Mbps, activation: 'paket 9gb' to 810820.
to all packages, but the 1 GB data pack, a 1 GB add-on for more data within the running time of the base package is offered for € 3.90. This offer will be texted to you when the base package is depleted. The 1 GB package and add-ons are not renewed, all others are. To stop, text activation code and the word 'aus' to 810820. Overuse is charged at the default rate. You can also use your online account (yesss! Kontomanager) or a mobile app called "yesss! App" to activate the data options. Yesss! adopts "roam like at home" within the EU, but data roaming is disabled by default. You have to enable data roaming before you can use it by sending SMS with 'roaming daten ein' to 810820 (or +43 681 810820 if you are already outside Austria). Yesss! applies caps on all data packages (see above). The new roaming tariff offer called 'Roaming 100', intended for travelers to Switzerland, Bosnia, Serbia, Turkey, US and Canada includes 100 units for minutes, SMS/MMS and MB, which can be automatically renewed up to 5 times when volume is used up. The roaming package costs € 14.99 valid for 30 days, and if the user wants to extend it in time, he needs to renew it manually. Bob is a brand of A1 and operates on the A1 network in 2G, 3G up to 21 Mbit/s and with one tariff on 4G/LTE too up to 50 Mbit/s. All their plans now include 4G/LTE capped at 50 Mbps. For registration check A1 section. On Sprich mit Bob plan you will be on the minibob tariff at 6.8c per min, SMS or MB in Austria and the EU by default. No other option is offered for the voice and data prepaid plan. Bob applies "roam like at home" in the EU at domestic rates up to a certain defined data limit (see EU cap above). Hofer (as the Austrian branches of Aldi discounter stores are called) started its own brand in 2015. It's called HoT (for Hofer Telekom) and uses the network of T-Mobile in 2G, 3G and 4G/LTE. It has become the most successful MVNO in the country so far. Starters can be purchased online to be sent to an Austrian address or at all Hofer supermarkets (Hofer Store Locator) for 1.99 €. Hybrid SIM cards with mini SIM, micro SiM and nano SIM are sold where they can be registered as well. Top-ups can be done by purchasing "Ladebons" (= vouchers) of 10 € or 20 € at Hofer stores. Your phone number (like 0677....) needs to be entered twice followed by the PIN code of the voucher online here for a recharge. Alternatively, you can use a credit card (Master, Visa, Diners or AmEx) or even a PayPal account to top-up directly online here: click on "mit Kreditkarte, Online Banking, PayPal". You can get the balance of your account if you send a SMS to 6700 with the word "GUTHABEN" or just type and call *101#, or use Mein HoT smartphone App. is a low 0.9c per MB, billing is in 102.4 KB increments (= 0.1 MB). This means 1 GB costs round about 9 €. Hot Flex default rate stays at max. 50 Mbps on LTE. HoT provides data roaming in the EU at domestic rates, but only if you register your SIM card with an Austrian address. For all non-registered SIM cards HoT assumes that the user is not tied to Austria and adds surcharges for EU roaming from the start. Furthermore, HoT applies an EU cap to its package and a strict 4-months limit for permanent roaming at domestic rates. Additionally, when roaming in some countries the service may be limited to 3G instead of 4G/LTE. For light users their per-MB rate ist still one of the lowest in Europe. To the default domestic rate of 0.9c per MB, a surcharge of 0.72c/MB may be added, making it 1.62c/MB in EU roaming without further restrictions. for some devices you must enable data roaming as this MVNO may be recognized as a roaming network. Be careful when enabled in Swiss border area as Swiss roaming is charged at 15.36 € per MB (!!! ), better make a manual network selection and lock it on Hot or T-Mobile. Eety was taken over by the Drei (3) network in 2015. It has been relaunched on this nework in 2G/3G and since 2016 in 4G/LTE with up to 50 Mbps DL and 10 Mbps UL is enabled on all plans except Basis. The traffic is routed via the Netherlands on a rather bad IP backbone. This leads to higher pings and to worse speeds to some destinations. Eety SIM cards are available in many stores and supermarkets in Austria like Lidl (store locator) and Pagro Diskont (store locator) and some other shops (full store locator). It comes as hybrid in all three sizes either for 1.99 € without credit or for 2.99 € with 1 € credit preloaded. 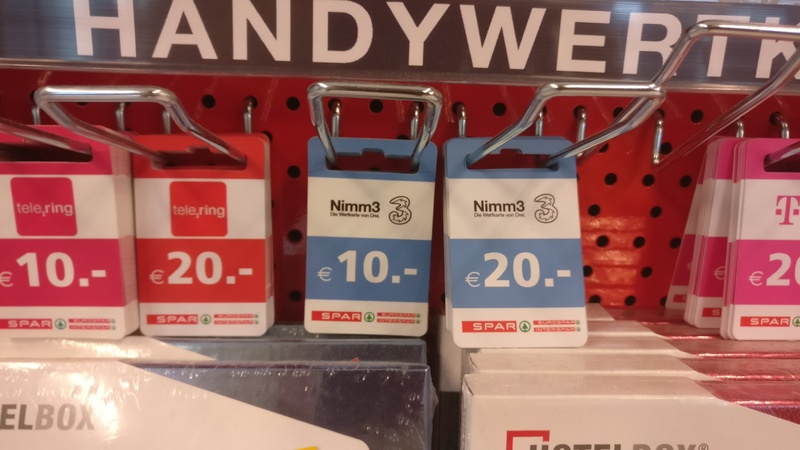 In addition they sometimes set up temporary stands in front of MediaMarkt/Saturn stores and sell SIMs for 8 € with 10 € credit preloaded. You can also order starter packs online and pay by credit card, but delivered only to Austrian and German postal adresses without surcharge. Registration can be done in the store that sell eety by foreign ID documents too. All online options however require an Austrian bank account for verification. eety Basis plan: base rate of 0.9c per MB in Austria and the EU at max. 7 Mbit/s, no 4G/LTE. Note, that you can't switch back from another plan to this plan again. eety Extra add-on: 5 € for another 1 GB data in Austria, not for internatl. roaming, activation: *151*1116#, valid for 12 months and used after the regular package has been depleted. Eety applies "roam like at home" in the EU at domestic rates up on some plans only up to a certain limit shown for each plan in the table above. Without limits it's only possible staying for roaming on the Basis plan at 0.9c/MB restricted to 7 Mbit/s on 3G. After 4 months of continous roaming a surcharge of 0.72c/MB may be applied additionally. In July 2018 they added a promotional plan called Top Promo available until 12/Sep/2018 with a roaming option. It contains for 9.90 € in 30 days 1000 mins and 500 SMS to Austria and all other EU countries, plus 6 GB data to be used in Austria (at max. 50 Mbit/s in 4G) as well as in the EU (at max. 7 Mbit/s in 3G), activation: *151*1125#. In an unusual arrangement, visitors from Hong Kong can purchase eety SIMs from 3 in Hong Kong before departure, but SIMs purchased in Hong Kong cost HK$ 158 (= more than 17 €), are preloaded with 3.3 GB data only, are non-reloadable, and have a non-extendable validity period of 30 days from first use. The website says that all EU/EEA countries are covered plus North Cyprus. The latter country is questionable and may be a mistake, as it follows EU/EEA zoning and excludes Switzerland and Turkey too. S-Budget Mobil is the MVNO of the SPAR supermarket group, one of Austrias biggest retail chains. It uses MVNE tele.ring and operates on the network of T-Mobile Austria in 2G, 3G and 4G/LTE. The starter pack is exclusively available in all SPAR, EUROSPAR and INTERSPAR markets (locator) where they register as well and online to be sent to an Austrian address. Be aware that the shipping cost is a hefty 3.90 €. So it's recommended to buy it from a Spar market instead. It's sold at 1.99 € with the "Small" plan pre-configured. SIM cards are hybrid SIMs breakable to all 3 sizes. Top-ups are with vouchers of 10, 15, 20 and 35 € available in all SPAR outlets. To top-up type *104*<voucher code>#. To check credit, type *102#, to check validty *103#. Aimed at tablets a data-only plan was introduced called S-Budget Connect. To migrate to this plan text CONNECT to 20771. The only option is a 7 GB package for 30 days at 7.90 € with speeds up to 100 Mbit/s. There is no way to upsize it until the month is over. You will surf on the default rate of 0.9c per MB of the Small plan instead. Note that international roaming is blocked on all plans by default. You can use S-Budget Mobil outside Austria only for voice and SMS, if you register your SIM card online the included mins and SMS can be used within the EU (for "Roam Like At Home"). Otherwise a surcharge will be added, but data roaming remains blocked. Spusu owned by Mass Reponse Service started as a MVNO on the 2G/3G Drei network in 2015. It couldn't be listed as their SIM cards were available online only. In 2016 things changed: 4G/LTE was added and offline sales in some shops began. Their starter pack (called "Spusu Wertkarte") is available online to be sent to an Austrian address and since 2017 in more than 1000 tobacconists (called Trafiken) countrywide. It's sold at 20 € including the same credit and can be registered. You can top-up with vouchers of 10, 20, 30 and 50 € sold in these tobacconists, by bank transfer (SEPA-account required), by credit card or Paysafecard online. You will be awarded a free 2 GB bonus for free at the first top-up. If you don't use it for more than 1 year, 2 € per month will be charged and when the balance is depleted the SIM will be shut off. Austrian regulator RTR has granted a permission for Spusu to temporarily charge roaming surcharges of 0.84c per MB. The only rate for EU roaming is therefore 1.24c per MB (= 12.50 € per GB). MediaMarkt Mobil and Saturn Mobil were the new MVNOs of the two electronic market chains MediaMarkt and Saturn with two different brands but an identical offer. They use network of Drei (3) in 2G, 3G and 4G/LTE up to 150 Mbit/s. Because of the new registration laws in Austria MediaMarkt and Saturn have suspended all new registrations starting from 1/JAN/2019. All existing SIM cards can be used until 31/MAR/2019 and may be migrated to their old Ge org! brand (see below) or any other provider. Ge org! is the "old" MVNO of the two electronic market chains Media Markt and Saturn. In contrast to their new product which uses the Drei network, Ge org! uses the network of A1 (2G, 3G and 4G/LTE up to 50 Mbits) and the portfolio is very similar to yesss! (see above). Ge org! is still exclusively sold by Media Markt and Saturn but it's future remains unclear since Media Markt and Saturn started the new MVNO brand in cooperation with Drei (see section above). The Internet package is no longer avaible in every Media Markt or Saturn, check availability and if necessary order in advance (see below). Here you can check the availability of Ge org! Internet using the button "market availability" at respective MediaMarkt or Saturn. If it is not available in the respective store it can be orderd to any store or Austrian postal adress. It can be payed and registered in the store when collecting it or with PayPal and credit cards. To top-up you can use vouchers sold at Media Markt and Saturn of 10, 20 or 50 € or by credit card in your online account called Kundencenter. To activate or change yout plan use their app or go to your online account. As data add-ons for extra volume the same packs as in Ge org Internet can be added. unlimited @ max. 50 Mbps: 24.99 € - no international roaming on this plan! For more data 1 GB can be added for 3.90 € (valid in the EU too). International roaming at domestic rates is capped for each data plan at the volumes given above, on the Ge org! dahoam plan it's disabled. Yooopi! is a MVNO of Alpinacom GmbH using MVNE Yesss! and the network of A1 in 2G, 3G and 4G. Yooopi! SIMs can be purchased online for free to be sent to an Austrian postal address. Yooopi! starter packs are available in Trafiken (= official tobacco stores), "handy"- and call shops where they can be registered as well. Top-ups are available at service stations like OMV, Shell, Emi or BP or supermarkets of the Spar group. To top up, type *122*<voucher code>#, check balance by *121#, check package by *123#. Management is possible by app or on your online account called Kontenmanager. "unlimited" (= FUP: 20 GB at 21 Mbit/s, then throttled to 128 kbps): 24.99 € - activation: 1115, no international roaming on this plan! All these packages auto-renew after 30 days, if not stopped by the activation command replacing 'ein" by 'aus'. Data in EU roaming is capped according to the quotas mentioned at the plans above. Wowww! is a MVNO of ICC Calling Cards GmbH using MVNE Yesss! and the network of A1 in 2G, 3G and 4G/LTE up to 50Mbit. Their portfolio is very similar to yooopi! Wowww! SIMs can be purchased online for free to be sent to an Austrian postal address. Wowww! starter packs and topups are available in at service stations like Shell, Jet or Esso, in tobacco stores, electroni markets like EP or Expert or post offices. SIM Card is given out in all 3 sizes. Their vouchers of 5, 10, 20 or 40 € never expire. Top-ups and SIM management like credit check is done by app or on your online account called Kontomanager. You can also Top-Up by calling 810820 free of charge and following the instructions. When you call first, instructions will be given in german. To switch to other languages, press "2" and you will be redirected to a selection of multible languages, including English. All activations by SMS to 810820. All packages auto-renew. To stop text <code> aus to 810820. Wowww! applies the strict FUP given out in EU roaming at the domestic rate for some packages, on others roaming is totally disabled. The UK-based MVNO started in 2013 in the Austrian market. It uses the network of A1 in 2G, 3G and 4G/LTE on some bundles. Lycamobile's prepaid SIM card can be purchased in their own outlets (locator: check 'SIM') or online to be sent to an Austrian postal address for free. They are given out in all three sizes but don't have credit on it and you need to make a top-up. Some shops give the SIM out for free. There should be a little box where you can take them. Other vendors only give them out when buying a product at their shop (often take out restaurants). If they don't give them free, try another location. Be sure to register your SIM there for activation. You can top-up online by using international Visa or Mastercard with a secure code or in many shops (locator: check 'top up') by vouchers or direct top-up. All packages auto-renew after one month, if you have enough credit. To stop, call customer service on 322 from your Lycamobile for free. Lycamobile offers its data bundles for roaming now up to the specified limit or at the default rate of 9c per MB. Vectone Mobile is a MVNO and operates on the T-Mobile Austria network (find details above) in 2G and 3G and 4G/LTE only on their Data Pocket Saver packages so far. Their SIM cards are free of charge and can be ordered online sent to an Austrian postal address or to another country where Vectone operates. In Austria they are sold at certain agencies that display their logo. The SIM will be activated once popped into the phone. Standard/micro and nano SIMs are sold. Top-up is done online or in selected stores as SIM cards come without pre-loaded credit. For topping up changing high bonuses are granted. Check their website in English for the current promotion. Check credit balance by *102#. The standard data rate outside of packages is at 0.19 € per MB. To activate type code. Packages with be renewed automatically. To stop renewal type *1652#, to check bundle allowance *1601#. All data bundles include roam at home, but exact implementation remains unclear. Tethering is forbidden according to Terms & Conditions; but enforcement of this is unclear. Delight Mobile is a MVNO and operates on the T-Mobile Austria network (find details above) in 2G and 3G and 4G/LTE. Their SIM cards are free of charge and can be ordered online sent to an Austrian postal address or to another country where Delight operates. In Austria they are sold at certain agencies that display their logo. The SIM will be activated once popped into the phone. Standard/micro and nano SIMs are sold. Top-up is done online or in selected stores as SIM cards come without pre-loaded credit. Check credit balance by *192#. To activate type code. Plans will auto-renew. To stop type *3103#, to check data balance type *3102#. M:tel Austria is a MVNO owned by Telekom Serbia operating on the A1 network (find details above) in 2G and 3G and since 2019 in 4G/LTE too. It offers special plans for the ex-Yugoslav community living in Austria given free roaming in the EU and the Telekom Serbia Group operators in Serbia, Bosnia-Herzegovina and Montenegro. Their SIM cards are sold in Lidl supermarkets and many different spots (locator- klick on "Wertkarte") where they can be registered. They can also be ordered online to an Austrian postal address. The starter package is available at 1.90 €. Hallo M: 5.90 € includes 2 GB data and 500 min or SMS to Austria and Telekom Serbia networks in Serbia, Bosnia-Herzegovina and Montenegro. Hallo L: 9.90 € includes 3 GB data and 1000 min or SMS to Austria and Telekom Serbia networks in Serbia, Bosnia-Herzegovina and Montenegro. Activation is through *100*3*3*1*1#. You can add another 2 GB for 30 days at 5 € and 5 GB at 9.90 €. For roaming in Telekom Serbia networks in Serbia, Bosnia-Herzegovina and Montenegro all surcharges have been scrapped in 2018 and data comes from packages without surcharges. For roaming in the EU a flat surcharge of 0.3c per MB is added to the domestic package rates. Outside of packages the default domestic data rate plus surcharge of 0.92c per MB is charged.